Hey, y'all! I feel like I haven't written a blog post in FOREVER but I needed to take a break. It was nice and I'm ready to get back in to the swing of things. I've missed y'all! A couple of weeks ago, I went over to my husband's grandparent's old place and came home with some rhubarb! We dug up most of it to transplant it here at the house but ended up with quite a few stalks in the process. 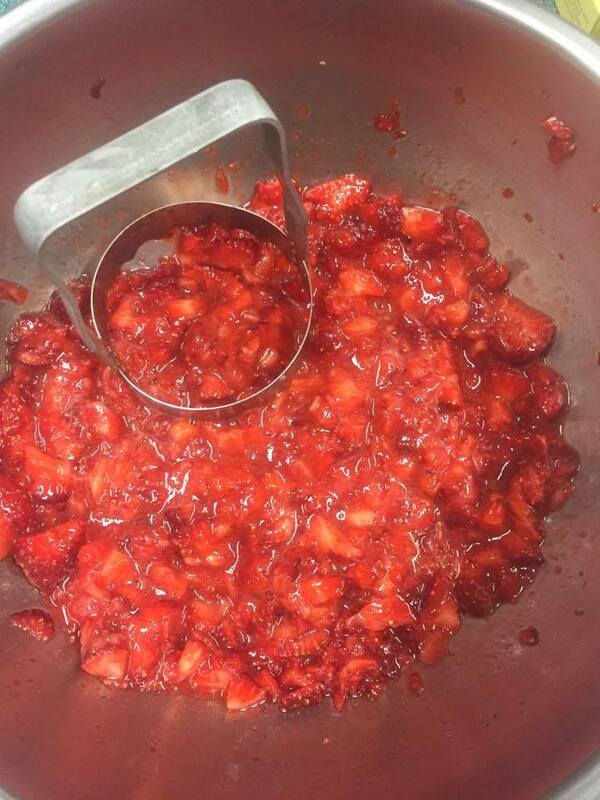 I knew exactly what I was going to use it for even before we got our hands on it: strawberry & rhubarb jam! My great-grandma Collett was the one who introduced this sweet-tart combo to me when I was a little girl. She would make the best strawberry rhubarb cobbler and I loved it from the very first bite. I've always liked the combination of sweet and tart flavors...maybe that's why I love Sour Patch Kids so much! As I was looking for some info about rhubarb, I came across the word "pie plant" in a couple of articles online. I immediately thought of the Little House On the Prairie books! I'm a HUGE Little House fan and recently re-read (for possibly the 100th time) the books in preparation of visiting the Ingall's homestead in De Smet, SD in a couple of weeks. In The First Four Years, Laura was deciding what she was going to fix for the threshers which also happened to be the first meal that she was fixing in her and Almonzo's new home. She said, "There was pie plant in the garden; she must make a couple of pies." She goes on to cook the big meal and accidentally forgot to add sugar to the pies. The threshers were all kind and added their own sugar but Laura was embarrassed by her mistake. Live and learn, right? As many times as I've read that book, I never knew what "pie plant" was. You can imagine my surprise when I discovered that it was rhubarb! Have any of y'all ever heard it referred to as pie plant? 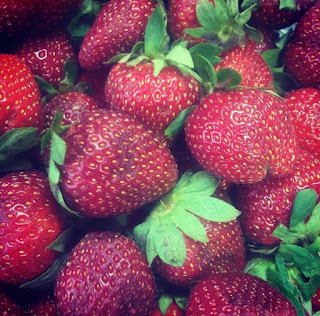 Once I got home with my rhubarb, I went to our local produce stand for strawberries. They were so pretty! The first thing you need to do, of course, is wash your strawberries and remove the stems and slice them up. I used my chopper that you see above to chop those things up! You could do this in a blender or food processor but why dirty up more than you really need to? I just used a little muscle and had those babies chopped up quicker than you could pull out a machine and load it up. Easy peasy, lemon squeezy. 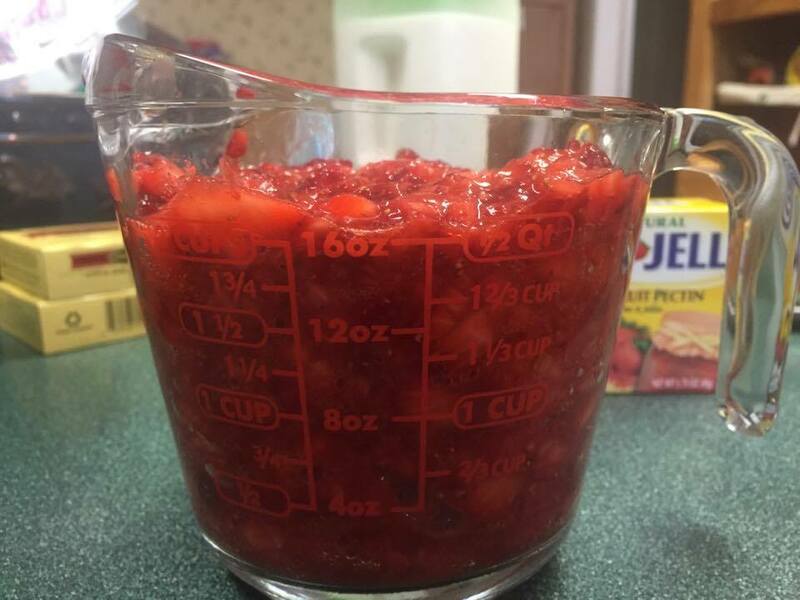 You're going to need 2 cups of chopped strawberries for one run of this jam. Next, you're going to wash and dice up your rhubarb. Not all rhubarb is completely red. 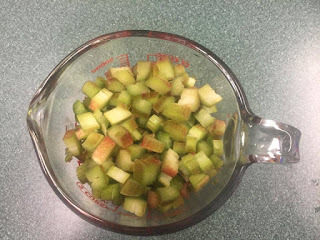 If you buy it from your grocery store or produce stand, you'll probably find the red variety because that's what most people want when purchasing rhubarb. There are a few different varieties and mine happens to be mostly green with a little red marbling in it. Whichever type you have, you'll need 2 cups for this recipe. Add your berries and rhubarb to a heavy duty pot. Add 1/4 cup of lemon juice to the mix along with one box of Sure Jell. I also like to add a little butter to prevent it from foaming up as much but this is optional. 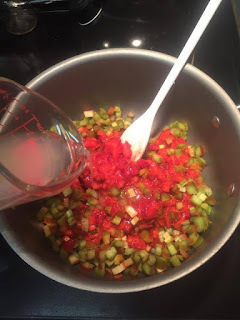 Bring the mixture to a rolling boil, stirring the whole time to prevent scorching. Once the mixture is boiling, add 4 cups of sugar. Bring the mixture back to a rolling boil and, while continuing to stir, boil for 1 minute. 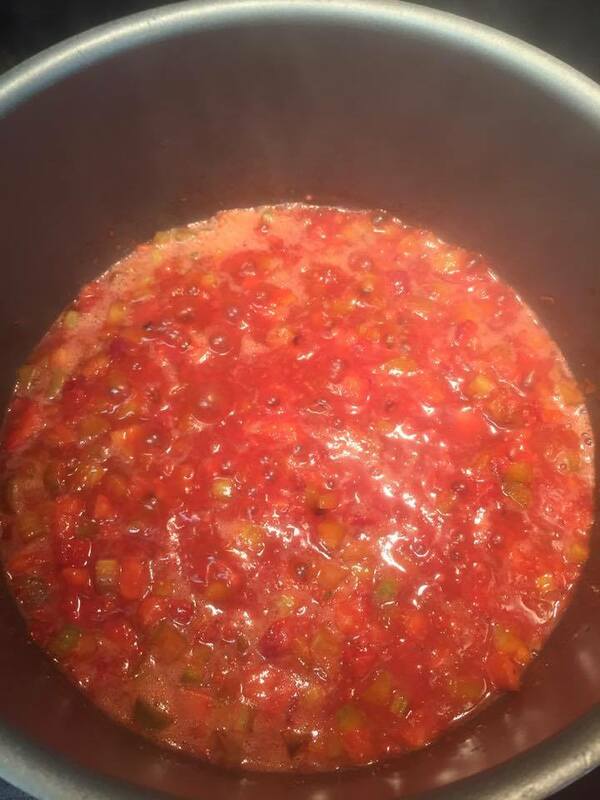 Remove from heat and ladle the mixture into hot jars leaving about an inch of space at the top. If you choose not to add the butter, skim the foam off of the top before ladling the mix into your jars. I used both pint and half pint jars. Wipe the rims clean and add hot lids and rings, finger tight. 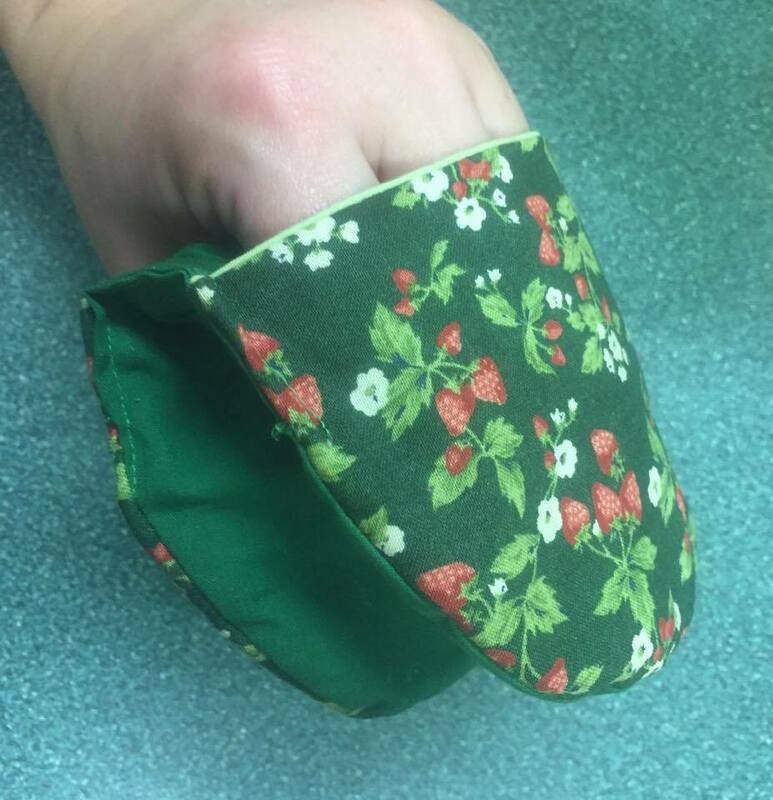 I used this little pot holder that my husband's granny made me to hold the jars while I put on the rings. She is also the one who originally planted the rhubarb. 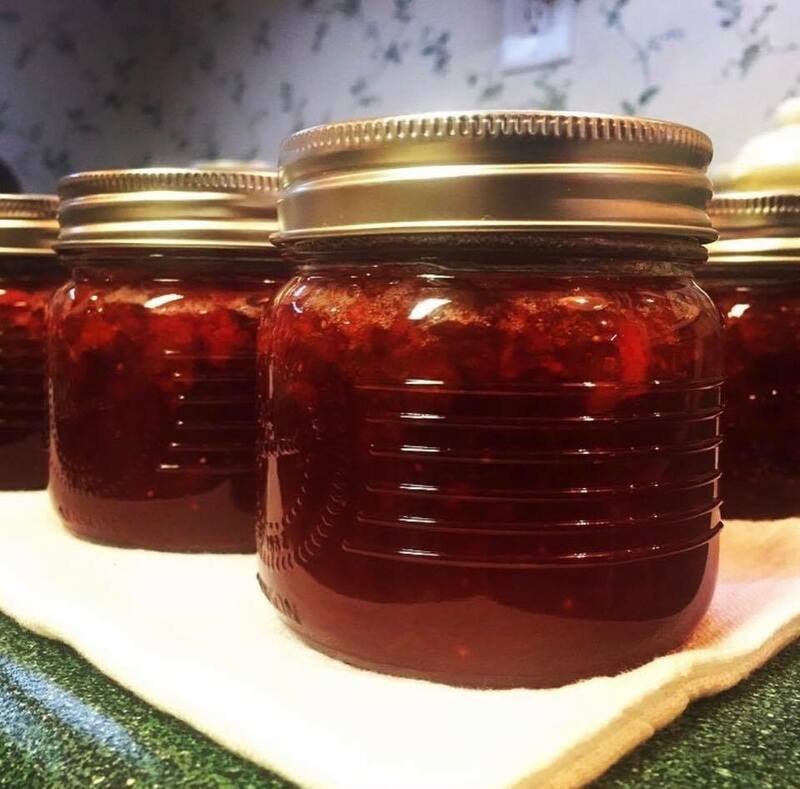 I thought of Granny Jones the whole time I made this jam. I think she would appreciate the fact that someone is still getting get use out of her work. 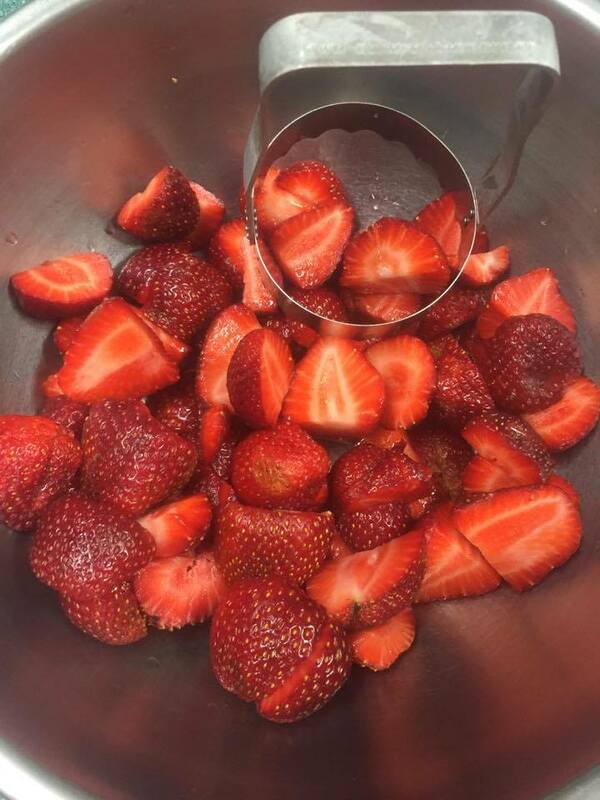 Once you have the jars full and sealed, add the hot jars to a boiling water bath and boil for 10 minutes. 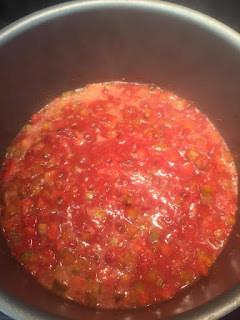 Remove from canner and set on a kitchen towel to cool. If you happen to have a jar that doesn't seal, just put it in the refrigerator and use it first! We've really been enjoying this stuff on biscuits and toast. I ended up making three runs and ended up with 4 pints and 12 half pints. One run should make around 6-8 half pints, depending on how much space you leave at the top. You can find the complete recipe below if you'd like to copy, paste, and print it out. Let me know if you make some! Bring first 5 ingredients to a boil on high heat. Add sugar & stir until dissolved. Continue to stir and bring to a boil for 1 minute. 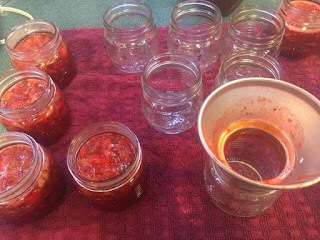 Remove from heat and ladle into clean, hot jars. Wipe rims and add lids and rings until finger tight. Add to boiling water bath for 10 minutes. Remove and allow to cool on kitchen towel.